BACKGROUND AND PURPOSE: Digital subtraction angiography (DSA) is the standard of reference for detecting cerebral vasospasm after subarachnoid hemorrhage (SAH). CT angiography (CTA) is a relatively recent method for depicting the intracranial arterial vasculature. The purpose of this study was to compare CTA and DSA in the detection and quantification of cerebral vasospasm. METHODS: Seventeen patients with SAH underwent initial CTA with or without DSA and follow-up CTA and DSA. The follow-up CTA and DSA studies were performed within 24 hours of each other and 5 to 10 days after SAH. Maximum intensity projection images were produced for each CTA. Six arterial locations were examined for spasm: the suprasellar internal carotid artery (ICA), the M1 and M2 segments of the middle cerebral artery, the A1 and A2 segments of the anterior cerebral artery, and the basilar artery. Vasospasm was categorized as none, mild (<30% luminal reduction), moderate (30% to 50% reduction), or severe (>50% reduction). RESULTS: The overall correlation between CTA and DSA was 0.757, but was better for proximal than distal locations (0.88–1.00 versus 0.152–0.446). Agreement between CTA and DSA was greater for no spasm (92%) and severe spasm (100%) than for mild (57%) or moderate (64%) spasm. CTA was highly accurate for no spasm or severe spasm in proximal locations (96%, and 100%, respectively); it was less accurate (90% and 95%, respectively) for mild or moderate spasm in these locations. For distal locations, the accuracy for absent, mild, moderate, or severe spasm was 78%, 81%, 94%, and 100%, respectively. CONCLUSION: CTA is highly sensitive, specific, and accurate in detecting no spasm or severe cerebral vasospasm in proximal arterial locations; it is less accurate for detecting mild and moderate spasm in distal locations. Vasospasm is one of the leading causes of morbidity and mortality in patients who survive subarachnoid hemorrhage (SAH) (1). As many as 50% of these patients may incur some degree of cerebral vasospasm (2). Vasospasm typically occurs 7 to 10 days after hemorrhage, and its prompt diagnosis is required to initiate appropriate therapy to avoid ischemic insults. The current standard of reference for detecting vasospasm is digital subtraction angiography (DSA). DSA provides accurate depiction of the intracranial vessels and the aneurysm-clip complex; however, it carries a total complication rate of approximately 5% and a permanent stroke rate of approximately 0.5% to 1% (3–7). Transcranial Doppler sonography is a noninvasive method for detecting vasospasm that has been shown to have a high sensitivity and specificity as compared with DSA (8, 9); however, its operator dependence and difficulty in accurately detecting vasospasm at sites other than the proximal middle cerebral artery (MCA) limit its use to a screening method only, with definitive diagnosis made by DSA. CT angiography (CTA) does not carry the neurologic risks of DSA. Moreover, it is less expensive and quicker than DSA and has been shown to depict the intracranial vasculature well in the setting of SAH (10–15). The possibility arises, then, that CTA may be able to replace the more invasive DSA in the definitive diagnosis of cerebral vasospasm. The purpose of this study was to compare CTA with DSA in its ability to accurately detect cerebral vasospasm in patients with SAH. In this prospective study, CTA was initially performed in patients in whom SAH had been diagnosed on plain CT studies. Subsequently, between day 5 and day 10 after hemorrhage, the patients underwent DSA and repeat CTA within 24 hours of each other. CTA was performed before DSA, as therapeutic intervention may have been necessary during the DSA examination. The initial and delayed CTA studies were performed in the same manner. An initial test bolus (20 mL) of contrast material was infused at a rate of 3 mL/s via an antecubital 20-gauge intravenous catheter. After a 10-second delay, 25 nonhelical axial cuts were taken every 1 second at the level of the sella turcica. A time to maximal intensity (HU) graph was made on the scanner, and a scan delay time for the CTA was taken at the time of maximal luminal enhancement (of the internal carotid artery [ICA]). The formal CTA examination consisted of 120 mL of contrast agent infused at a rate of 3 mL/s via the antecubital intravenous catheter. Helical scanning, which began after the appropriate scan delay as calculated in the test infusion, was performed from the craniocervical junction to 30 mm above the floor of the sella turcica. The pitch was 1.4, with 280 to 320 mA and 200 kHz. The 1-mm source axial images were reconstructed to 0.5-mm axial images, and the reconstructed images were then transferred to a computer workstation for 3D reconstruction. Maximum intensity projection (MIP) images were produced by initially removing bone via a thresholding technique and then manually editing the images to remove any remaining bone of the skull base. All MIP reconstructions were performed by the same experienced investigator. The MIP images were acquired every 30° while rotating through 180° in two planes. The DSA studies were performed using the transfemoral Seldinger technique, and anteroposterior, lateral, and lateral oblique views were obtained. The CTA and DSA examinations were reviewed by separate investigators. The initial and delayed CTA examinations were reviewed for presence of spasm by comparing corresponding vessel diameter on the initial and follow-up studies. These results were then compared with findings on the corresponding DSA image. A total of six arterial locations were examined. Arteries were divided into proximal (suprasellar ICA, M1 segment of the MCA, A1 segment of the anterior cerebral artery, and basilar artery) and distal (A2 and M2 segments) locations. Using calipers and a finely calibrated ruler, the investigators categorized the degree of vasospasm as none, mild (<30% luminal narrowing), moderate (30% to 50% luminal narrowing), and severe (>50% luminal narrowing). The CTA and DSA examinations were compared using Spearman correlation coefficient for sensitivity, specificity, and accuracy. Predictive values were also calculated. A positive predictive value refers to the proportion of positive CTA results that were truly positive (on DSA studies). Similarly, a negative predictive value refers to the proportion of negative CTA results that were truly negative (on DSA studies). Statistical significance was calculated using Fisher's exact test. All patients gave informed consent to enter the study, and ethical approval was granted by the institution. Seventeen patients were studied. The overall agreement between CTA and DSA for all locations and degrees of vasospasm was 86% (Table 1), with a correlation coefficient of 0.757 (P < .001). The vast majority of arteries in this series had no spasm while a few had severe spasm (131 versus 7). The best agreement and correlation between CTA and DSA by location occurred in the more proximal sites; that is, the ICA, A1 (Fig 1), M1 (Fig 2), and basilar (Fig 3) arteries (Table 1). The distal arterial locations (A2 and M2) had a poorer overall degree of correlation. At all locations, agreement between CTA and DSA was greater for no spasm or for severe spasm; detection of mild or moderate spasm by CTA was poorer (Table 1). CTA tended to exaggerate the degree of spasm at the proximal locations and to equally over- and underrate spasm at the distal sites. In general, most discrepancies between CTA and DSA were in detecting mild and moderate degrees of spasm. A, Preoperative MIP image from a CTA study shows an anterior communicating artery aneurysm (arrow). B, Postoperative CTA shows clipping of the aneurysm and narrowing of the anterior cerebral artery (arrows), consistent with vasospasm. C, DSA, anteroposterior view, confirms vasospasm involving the A1 segment of the anterior cerebral artery (arrows). A, Preoperative CTA, anteroposterior view, shows a left MCA aneurysm (arrow). B, Postoperative CTA shows the clipped aneurysm and narrowing of the first segments of the left ipsilateral anterior (curved arrow) and middle cerebral (straight arrow) arteries. C, DSA, anteroposterior view, verifies vasospasm of the left anterior and middle cerebral arteries ipsilateral to the aneurysmal rupture (arrows). 28-year-old man with an aneurysmal SAH. A, Preoperative CTA, MIP image, reveals a posterior communicating artery aneurysm (arrow). B, Postoperative CTA shows severe basilar artery spasm (open arrow) and carotid artery occlusion (solid arrow). C, DSA, lateral view, confirms basilar artery vasospasm (arrow). D, DSA, lateral oblique view, verifies supraclinoid ICA occlusion (arrow). Table 2 displays various statistical parameters comparing CTA with DSA for each degree of spasm in all locations. CTA is highly sensitive and accurate in detecting no or severe spasm; it is much less sensitive in depicting mild or moderate spasm, although it remains quite specific. On initial examination of the data (Table 1), CTA was found to correlate with DSA to a greater degree for the proximal arterial locations (r = .921 versus .348 for distal locations, P < .001). Tables 3 and 4 show various statistics for proximal versus distal sites. Comparing Table 3 with Table 2, CTA is more sensitive and accurate for proximal than for distal locations. CTA is highly sensitive, specific, and accurate for depicting no spasm or severe spasm; however, sensitivity and accuracy are poorer for depicting mild and moderate degrees of spasm (Table 3). CTA showed a high degree of positive predictability for detecting no spasm or severe spasm, meaning that when CTA findings suggest no or severe spasm, there is a high probability that a DSA examination will disclose similar results. In examining the data for distal arteries (A2 and M2), we found generally poorer results than for the proximal locations (Table 4). CTA was still perfect for detecting severe spasm, but was moderately sensitive and poorly specific for depicting no spasm and was very insensitive for detecting mild and moderate spasm. In this series, 15 (9%) of 172 arteries were not visible at follow-up CTA (Table 1). One third of these were at the A1 segment, whereas the ICA and the M2 segment had roughly a third each. In every case in which the artery was not adequately visualized for measurement, the reason could be attributed to an aneurysm clip artifact. At our institution, titanium clips are not routinely used, therefore a considerable number of clip artifacts occur on CTA studies. These artifacts typically extend 4 to 5 mm around the clip, making assessment of the aneurysm remnant/clip complex impossible, and obscuring any arteries within this range. Cerebral vasospasm if undetected and untreated can cause significant morbidity in patients with SAH. Most institutions routinely perform DSA 7 to 10 days after SAH in order to detect vasospasm. To date, DSA has been the mainstay for assessing spasm; however, transcranial Doppler sonography is a noninvasive method that has been widely used. This tool has been shown to be 84% to 85% sensitive and 89% to 98% specific in detecting spasm at the proximal MCA location (8, 9, 16). Transcranial Doppler sonography can be used on a daily basis with minimal cost and risk to the patient; however, its operator dependence and limited application to the whole intracerebral vasculature limits its effectiveness in making a definitive diagnosis. This is reserved for DSA. CTA is a minimally invasive technique previously proved to accurately depict the intracranial vasculature in the setting of SAH (13–15, 17). Because CTA is less costly and involves less risk to the patient than DSA, and displays the intracerebral vessels well, it may be considered as a replacement for DSA in the definitive diagnosis of spasm. To date, little has been reported about the applicability of CTA in detecting vasospasm after SAH. In one initial study involving two patients, the authors reported similar rates of depiction of spasm between CTA and DSA; however, no objective measurements were made (18). Since that initial study, a few articles have appeared in which CTA was reported to have accurately depicted spasm in patients after SAH. Zouaoui et al (15), in their series of 120 patients with SAH, found vasospasm on CTA examinations in five patients. Similarly, Velthuis et al (19) reported three cases of vasospasm on CTA examinations in their series of 80 patients. A study by Van Loon et al (20), in which CTA was performed in 11 patients postoperatively, found three cases of vasospasm. However, because none of these studies initially set out to examine the utility of CTA in detecting vasospasm, no formal objective measurements were made. Takagi et al (21) compared CTA with DSA in seven patients with spasm on an initial CTA examination and found severe spasm (>75% luminal reduction) in five patients and moderate spasm (50% to 75% reduction) in two patients. All seven of these cases of spasm would have been graded as severe by the classification scheme used in the present series, making their detection rate by CTA the same as ours, or 100%. These authors did not objectively assess findings of absent spasm or spasm of less than 50% luminal reduction, as we did in this series. CTA is potentially an ideally suited method for assessing patients with SAH for vasospasm. Typically, these patients will require a plain CT study of the head, at which time CTA can be added without the additional time, expense, and expertise required for DSA. For CTA to be considered a replacement for DSA in this capacity, its accuracy must be substantiated, which is what we tried to accomplish in this study. We, like Takagi et al (21), found CTA to be perfect in detecting severe spasm (>50% luminal reduction) and to be highly sensitive and accurate in detecting normal vessels in the absence of spasm. Vasospasm was best detected in proximal arterial locations (ICA, A1, M1, and basilar arteries) and when categorized as either absent or severe. Mild or moderate spasm (1% to 50% luminal reduction) was less well detected, especially in distal locations (A2 and M2). In several of our cases an artery or an aneurysm-clip complex could not be assessed owing to aneurysm clip artifacts. Thus, the presence or absence of spasm could not be determined by CTA. These are important disadvantages of CTA, since the presence of an aneurysm remnant may require further treatment. The use of titanium clips greatly reduces the extent of artifacts (20), but their cost presently limits their routine use. We found CTA to be highly accurate in detecting either no spasm or severe vasospasm in proximal arterial location, as compared with DSA. Aneurysm clip artifacts remain a problem, and the importance of this limitation must be understood and addressed if CTA is to replace DSA in the routine postoperative care of patients with SAH. ↵1 Address reprint requests to Glenn B. Anderson, MD, Division of Neurosurgery, University of Alberta, 2D1 WMC, 8440–112 St, Edmonton, Alberta, Canada T6G 2B7. Accepted after revision January 20, 2000. 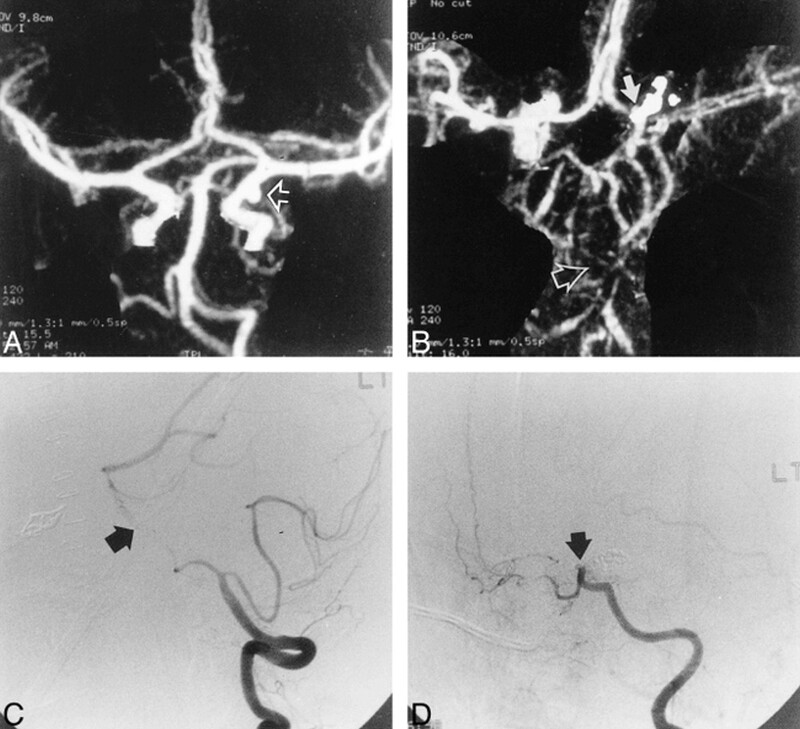 MR Angiography for the Diagnosis of Vasospasm after Subarachnoid Hemorrhage. Is It Accurate? Is It Safe?